Welcome to Time Out Singapore's 52 Weeks of #ExcitingSG – our commitment to showing you the best of what's going on in the city this week. Every Monday, a guest writer who's "in" with the scene shares a recommendation on what to see, eat, do or buy in the city. This Chinese New Year, give your festive playlist a spin with alternative hip-hop outfit Yeti Pack. 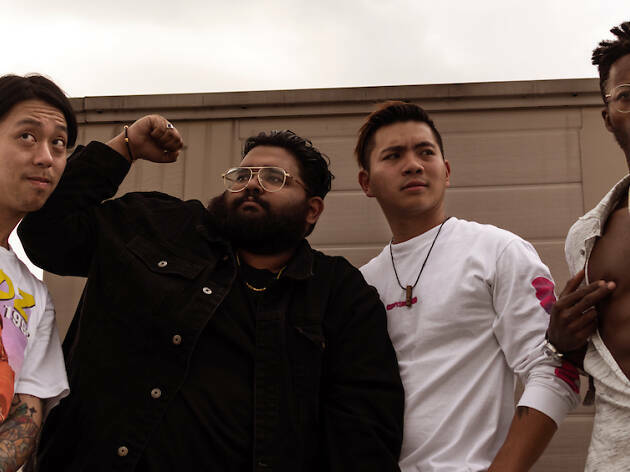 Fresh off the recording studio, the rap quartet released their latest single Fengshui in time for Lunar New Year. The track boasts East-Asian-inspired plucks and synths topped with humourous tongue-in-cheek lyrics. But are they a force to be taken lightly? Hi guys! What gets you excited about Singapore? The fact that it's home. Right now, three of our four members are studying in UK and the US, so home – where the company is good, but the food is better – excites us. Talk us through the name Yeti Pack. We originally just had the name Yeti. But this was before our official move to online streams where we needed to have a unique name as Yeti was, unsurprisingly, already taken. We also chose the word ‘yeti’ because the yeti is a mythical animal that no one has seen or has proof of, yet people know about it. We want that to be our landmark for success – where people who haven't even heard our music or seen us know about us. And ‘pack’ because that's our mentality as a group. We stand strong alone but we stand stronger united. Broke AF managed to snag a spot on Spotify’s SG Viral Top 50s playlist among others. Did you ever expect the single to be a success when you released it last year? We released Broke AF along with all our previous singles. However, this was the one that popped. Broke AF was co-written by J.Son from Homeground Studios who made it pop even further. We always believe in ourselves and our music, and to see that belief being reciprocated is quite surreal. To be on the viral chart of our very own home soil is just an immeasurable feeling. Okay, let’s talk about your track Fengshui. It’s loaded with humour and ad-libs à la Migos – is it meant to be a parody of sort? Honestly, we kind of give off that parody vibe because we're just four dudes having a good time making music. To us, everything is about fun. And if you're having fun too, then that's our job done! We definitely do draw inspiration from Migos but we lead vastly different lives from them. Perhaps our take is less of a parody and more of a light-hearted nod. The single is out just in time for Chinese New Year. What are your CNY plans? To be with our families. For those of us overseas who can't really do that, just being around friends does the trick. We video call every now and then, so maybe this week might be a reunion dinner video call or something. Jokes aside, festive times like these are the hardest when you're away from family. But we always remember what keeps us grounded and what keeps us going. Which places in Singapore do you reckon to have the best fengshui? To be honest, all you need are good vibes and personality – that's all the 'fengshui' you need. It's really more of a mantra to us, a message to be the best you can be and to spread that positivity around. No point consulting a fengshui master to place things very beautifully in your house when you yourself have an ugly soul. Be the best you can be! Any upcoming projects/gigs we ought to look out for? Well, 2019 is the year we want to take the world by storm. We intend to go global this year and we want our sound to evolve further. Yeti Pack will not be releasing new tracks for a while but until then, our members are individually going to be dropping tunes – very different sounds from what we do together as Yeti Pack. Look out for updates on our Instagram @yetipack.